Replacement for conventional fluorescent tubes lights. Easy install just plug in. FAST DELIVERY - These Milky Cover T8 LED Tube Lights 8ft 45W Ship from LA warehouse via FedEx,3-7 days delivered,No importing duty. LED Tube Lights with FA8 Base - Cold White 6000 Kevin comes with frosted cover ( which emits more light than frosted cover) and give very bright light output, With 100 lumen/watt it will emit up to 4500 lumens in lighting.These lights can be used Indoor or outdoor (with no direct exposure to water), can work in -20C to 50C temperature conditions. 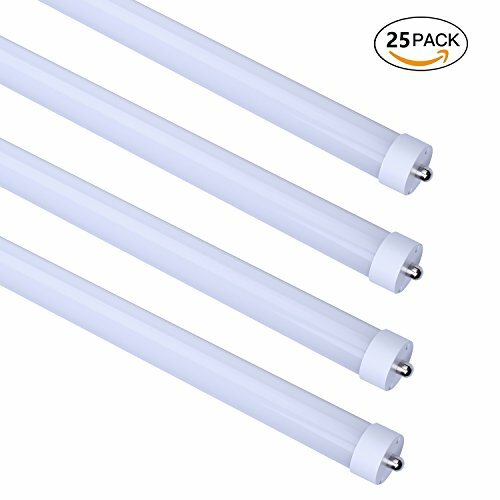 SAVE 65% INSTANTLY - This 25-Pack LED 45W 8Ft Tube Light Bulb Frosted cover with FA8 single pin Save 65% on your electricity bill. Replace 100 Watt fluorescent tubes with 45 Watt LED Tube (Lighting output 4500 lumens) . EASY INSTALLATION - International standard shape for 8 ft tube light FA8 Base, Easily fitted instead of traditional fluorescent tube lamps, bypass the starter and ballast before installation.